2014 MU69, the first classical Kuiper belt object visited by a spacecraft. A classical Kuiper belt object, also called a cubewano (/ˌkjuːbiːˈwʌnoʊ/ "QB1-o"), is a low-eccentricity Kuiper belt object (KBO) that orbits beyond Neptune and is not controlled by an orbital resonance with Neptune. Cubewanos have orbits with semi-major axes in the 40–50 AU range and, unlike Pluto, do not cross Neptune's orbit. That is, they have low-eccentricity and sometimes low-inclination orbits like the classical planets. The name "cubewano" derives from the first trans-Neptunian object (TNO) found after Pluto and Charon, 15760 Albion, which until January 2018 had only had the provisional designation (15760) 1992 QB1. Similar objects found later were often called "QB1-o's", or "cubewanos", after this object, though the term "classical" is much more frequently used in the scientific literature. Haumea was provisionally listed as a cubewano by the Minor Planet Center in 2006, but turned out to be resonant. Semimajor axis and inclination of cubewanos (blue) compared to resonant TNOs (red). There are two basic dynamical classes of classical Kuiper-belt bodies: those with relatively unperturbed ('cold') orbits, and those with markedly perturbed ('hot') orbits. Most cubewanos are found between the 2:3 orbital resonance with Neptune (populated by plutinos) and the 1:2 resonance. 50000 Quaoar, for example, has a near-circular orbit close to the ecliptic. Plutinos, on the other hand, have more eccentric orbits bringing some of them closer to the Sun than Neptune. The majority of classical objects, the so-called cold population, have low inclinations (< 5°) and near-circular orbits, lying between 42 and 47 AU. A smaller population (the hot population) is characterised by highly inclined, more eccentric orbits. The terms 'hot' and 'cold' has nothing to do with surface or internal temperatures. Instead, the terms 'hot and 'cold' refer to the orbits of the objects, by analogy to particles in a gas, which increase their relative velocity as they become heated up. The Deep Ecliptic Survey reports the distributions of the two populations; one with the inclination centered at 4.6° (named Core) and another with inclinations extending beyond 30° (Halo). The vast majority of KBOs (more than two-thirds) have inclinations of less than 5° and eccentricities of less than 0.1. Their semi-major axes show a preference for the middle of the main belt; arguably, smaller objects close to the limiting resonances have been either captured into resonance or have their orbits modified by Neptune. The 'hot' and 'cold' populations are strikingly different: more than 30% of all cubewanos are in low inclination, near-circular orbits. The parameters of the plutinos’ orbits are more evenly distributed, with a local maximum in moderate eccentricities in 0.15–0.2 range and low inclinations 5–10°. See also the comparison with scattered disk objects. Left: TNO distribution of cubewanos (blue), resonant TNOs (red), SDOs (grey) and sednoids (yellow). Right: Comparison of the aligned orbits (polar and ecliptic view) of cubewanos, plutinos, and Neptune (yellow). In addition to the distinct orbital characteristics, the two populations display different physical characteristics. The difference in colour between the red cold population, such as 2014 MU69, and more heterogeneous hot population was observed as early as in 2002. Recent studies, based on a larger data set, indicate the cut-off inclination of 12° (instead of 5°) between the cold and hot populations and confirm the distinction between the homogenous red cold population and the bluish hot population. Another difference between the low-inclination (cold) and high-inclination (hot) classical objects is the observed number of binary objects. Binaries are quite common on low-inclination orbits and are typically similar-brightness systems. Binaries are less common on high-inclination orbits and their components typically differ in brightness. This correlation, together with the differences in colour, support further the suggestion that the currently observed classical objects belong to at least two different overlapping populations, with different physical properties and orbital history. There is no official definition of 'cubewano' or 'classical KBO'. However, the terms are normally used to refer to objects free from significant perturbation from Neptune, thereby excluding KBOs in orbital resonance with Neptune (resonant trans-Neptunian objects). The Minor Planet Center (MPC) and the Deep Ecliptic Survey (DES) do not list cubewanos (classical objects) using the same criteria. Many TNOs classified as cubewanos by the MPC are classified as ScatNear (possibly scattered by Neptune) by the DES. Dwarf planet Makemake is such a borderline classical cubewano/scatnear object. (119951) 2002 KX14 may be an inner cubewano near the plutinos. Furthermore, there is evidence that the Kuiper belt has an 'edge', in that an apparent lack of low-inclination objects beyond 47–49 AU was suspected as early as 1998 and shown with more data in 2001. Consequently, the traditional usage of the terms is based on the orbit's semi-major axis, and includes objects situated between the 2:3 and 1:2 resonances, that is between 39.4 and 47.8 AU (with exclusion of these resonances and the minor ones in-between). These definitions lack precision: in particular the boundary between the classical objects and the scattered disk remains blurred. As of 2010, there are 377 objects with perihelion (q) > 40 AU and aphelion (Q) < 47 AU. its average eccentricity is less than 0.2. An alternative classification, introduced by B. Gladman, B. Marsden and C. van Laerhoven in 2007, uses a 10-million-year orbit integration instead of the Tisserand's parameter. Classical objects are defined as not resonant and not being currently scattered by Neptune. Unlike other schemes, this definition includes the objects with major semi-axis less than 39.4 AU (2:3 resonance)—termed inner classical belt, or more than 48.7 (1:2 resonance) – termed outer classical belt, and reserves the term main classical belt for the orbits between these two resonances. The first known collisional family in the classical Kuiper belt—a group of objects thought to be remnants from the breakup of a single body—is the Haumea family. It includes Haumea, its moons, 2002 TX300 and seven smaller bodies.† The objects not only follow similar orbits but also share similar physical characteristics. Unlike many other KBO their surface contains large amounts of ice (H2O) and no or very little tholins. The surface composition is inferred from their neutral (as opposed to red) colour and deep absorption at 1.5 and 2. μm in infrared spectrum. Several other collisional families might reside in the classical Kuiper belt. †As of 2008. The four brightest objects of the family are situated on the graphs inside the circle representing Haumea. 2014 MU69 imaged by the New Horizons spacecraft on 1 January 2019. 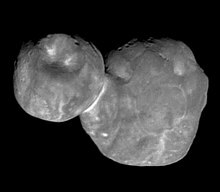 As of January 2019, only one classical Kuiper belt object has been observed up close by spacecraft. Both Voyager spacecrafts have passed through the region before the discovery of the Kuiper belt. New Horizons was the first mission to visit a classical KBO. After its successful exploration of the Pluto system in 2015, the NASA spacecraft has visited the small KBO (486958) 2014 MU69 at a distance of 3,500 kilometres (2,200 mi) on January 1, 2019. For a more comprehensive list, see List of trans-Neptunian objects § List. Here is a very generic list of classical Kuiper belt objects. As of March 2018[update], there are about 579 objects with q > 40 AU and Q < 48 AU. ^ David Jewitt. "Classical Kuiper Belt Objects". David Jewitt/UCLA. Retrieved July 1, 2013. ^ a b c d Brian G. Marsden (2010-01-30). "MPEC 2010-B62 : Distant Minor Planets (2010 FEB. 13.0 TT)". IAU Minor Planet Center. Harvard-Smithsonian Center for Astrophysics. Archived from the original on 2012-09-04. Retrieved 2010-07-26. ^ "MPEC 2006-X45 : Distant Minor Planets". IAU Minor Planet Center & Tamkin Foundation Computer Network. 2006-12-12. Retrieved 2008-10-03. ^ Levison, Harold F.; Morbidelli, Alessandro (2003). "The formation of the Kuiper belt by the outward transport of bodies during Neptune's migration". Nature. 426 (6965): 419–421. Bibcode:2003Natur.426..419L. doi:10.1038/nature02120. PMID 14647375. ^ Jewitt, D. (2004). "Plutino". Archived from the original on 2007-04-19. ^ A. Doressoundiram; N. Peixinho; C. de Bergh; S. Fornasier; P. Thebault; M. A. Barucci; C. Veillet (October 2002). "The Color Distribution in the Edgeworth-Kuiper Belt". The Astronomical Journal. 124 (4): 2279. arXiv:astro-ph/0206468. Bibcode:2002AJ....124.2279D. doi:10.1086/342447. ^ Nuno Peixinho; Pedro Lacerda; David Jewitt (August 2008). "Color-inclination relation of the classical Kuiper belt objects". The Astronomical Journal. 136 (5): 1837. arXiv:0808.3025. Bibcode:2008AJ....136.1837P. doi:10.1088/0004-6256/136/5/1837. ^ K. Noll; W. Grundy; D. Stephens; H. Levison; S. Kern (April 2008). "Evidence for two populations of classical transneptunian objects: The strong inclination dependence of classical binaries". Icarus. 194 (2): 758. arXiv:0711.1545. Bibcode:2008Icar..194..758N. doi:10.1016/j.icarus.2007.10.022. ^ Trujillo, Chadwick A.; Brown, Michael E. (2001). "The Radial Distribution of the Kuiper Belt" (PDF). The Astrophysical Journal. 554 (1): L95–L98. Bibcode:2001ApJ...554L..95T. doi:10.1086/320917. Archived from the original (PDF) on 2006-09-19. ^ "JPL Small-Body Database Search Engine". JPL Solar System Dynamics. Retrieved 2010-07-26. ^ a b Gladman, B. J.; Marsden, B.; van Laerhoven, C. (2008). "Nomenclature in the Outer Solar System" (PDF). In Barucci, M. A.; et al. (eds.). The Solar System Beyond Neptune. Tucson: University of Arizona Press. ISBN 978-0-8165-2755-7. ^ Brown, Michael E.; Barkume, Kristina M.; Ragozzine, Darin; Schaller, Emily L. (2007). "A collisional family of icy objects in the Kuiper belt". Nature. 446 (7133): 294–6. Bibcode:2007Natur.446..294B. doi:10.1038/nature05619. PMID 17361177. ^ Pinilla-Alonso, N.; Brunetto, R.; Licandro, J.; Gil-Hutton, R.; Roush, T. L.; Strazzulla, G. (2009). "The surface of (136108) Haumea (2003 EL61), the largest carbon-depleted object in the trans-Neptunian belt". Astronomy and Astrophysics. 496 (2): 547. arXiv:0803.1080. Bibcode:2009A&A...496..547P. doi:10.1051/0004-6361/200809733. ^ Pinilla-Alonso, N.; Licandro, J.; Gil-Hutton, R.; Brunetto, R. (2007). "The water ice rich surface of (145453) 2005 RR43: a case for a carbon-depleted population of TNOs?". Astronomy and Astrophysics. 468 (1): L25–L28. arXiv:astro-ph/0703098. Bibcode:2007A&A...468L..25P. doi:10.1051/0004-6361:20077294. ^ Chiang, E.~I. (July 2002). "A Collisional Family in the Classical Kuiper Belt". The Astrophysical Journal. 573 (1): L65–L68. arXiv:astro-ph/0205275. Bibcode:2002ApJ...573L..65C. doi:10.1086/342089. ^ de la Fuente Marcos, Carlos; de la Fuente Marcos, Raúl (11 February 2018). "Dynamically correlated minor bodies in the outer Solar system". Monthly Notices of the Royal Astronomical Society. 474 (1): 838–846. arXiv:1710.07610. Bibcode:2018MNRAS.474..838D. doi:10.1093/mnras/stx2765. ^ Stern, Alan (28 February 2018). "The PI's Perspective: Why Didn't Voyager Explore the Kuiper Belt?". Retrieved 13 March 2018. ^ Lakdawalla, Emily (24 January 2018). "New Horizons prepares for encounter with 2014 MU69". Planetary Society. Retrieved 13 March 2018. This page was last edited on 29 March 2019, at 04:00 (UTC).